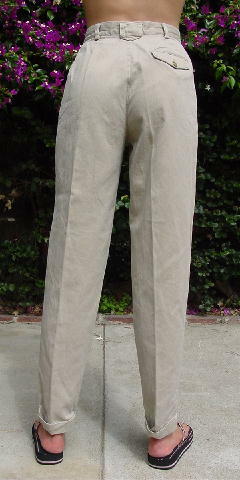 These khaki color pants are by Calvin Klein Sport, were made in the USA, and are 100% cotton. They have belt loops, a 1 1/2" wide waistband, and a 6" long front zipper fly. The back has a one button flap pocket and the front has two vertical pockets and four pleats. 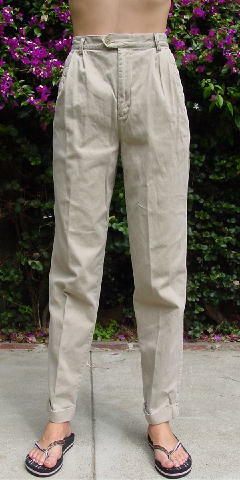 The pant legs have 1 1/4" wide cuffs that are stitched in place at the two side seams. The stitching is held in place by 4 clear buttons on the inside of the cuffs. They're from a California model.